This church was a large, rectangular structure with a double-pitched roof and no dome. Internally, it had a single nave ending in a semicircular apse. The entrance appears to have been on the west elevation. Along the internal north and south walls was an arcade of three bays separated by engaged columns. Arches rising from these columns crossed the width of the nave and supported a barrel vaulted roof. There was a window in the apse, and in at least one bay of the south wall (not shown on the plan below). Under the nave there was a long, barrel vaulted room. It was partly underground and may have served as a crypt. If it had an external entrance then it would have been on the south facade. Old photographs indicate that a structure was once built against the south wall of the church, perhaps it served as a vestibule to this vaulted room. Only the north wall of the nave now remains standing. Most of the south wall had collapsed around the year 1840, but the walls of the apse still survived. To consolidate the structure, missing facing stones at the base of the apse were replaced in a restoration undertaken by Nikoli Marr in 1912. 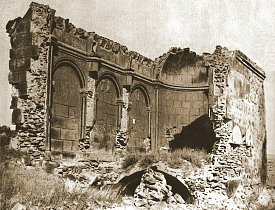 The church was in its current condition by the early 1960s, when the Turkish-Armenian photographer Ara Güler photographed it. 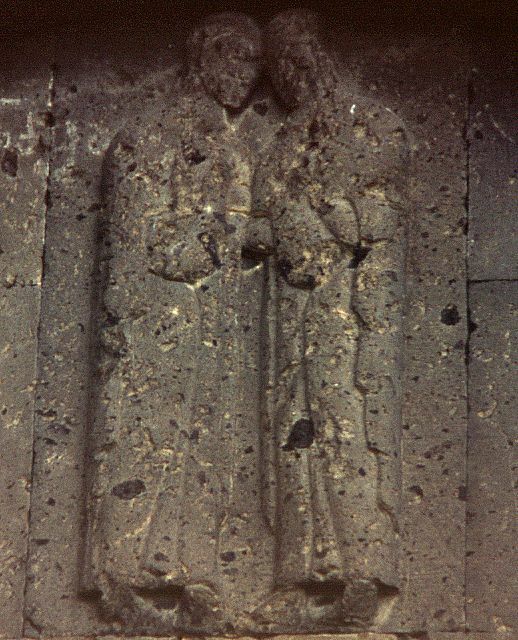 In the two arcades closest to the apse are groups of figurative sculpture carved in bas-relief. These depict two scenes from the Live of the Virgin: the Annunciation and the Visitation. 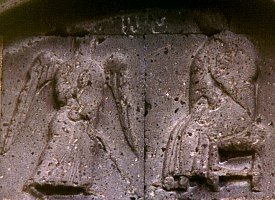 The scenes are depicted in the conventional manner, except that none of the figures have halos. The Annunciation depicts the moment when the Angel Gabriel tells Mary that she is carrying the incarnation of God; "Hail thou that art favoured, the Lord is with Thee", (Luke 1:28). 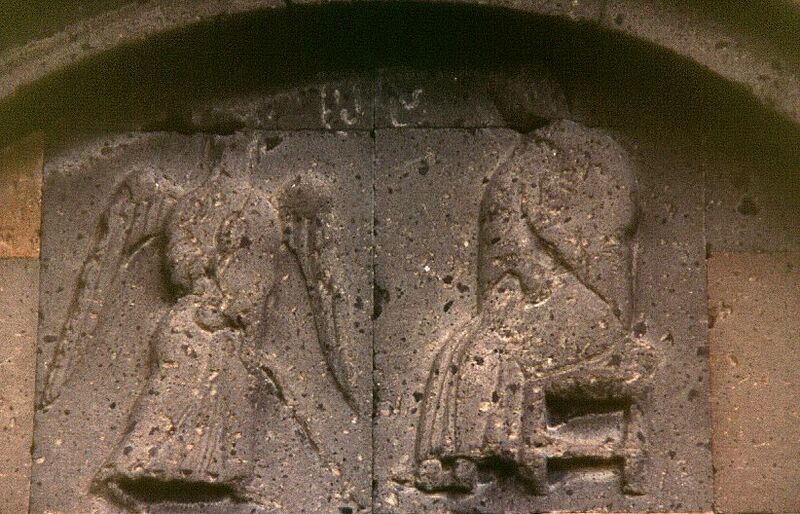 The Visitation happened shortly after the Annunciation. Mary paid a visit to her cousin Elizabeth, who was also pregnant (having miraculously conceived the future St. John the Baptist). They embraced and "when Elizabeth heard the salutation of Mary, the babe leapt in her womb; and Elizabeth was filled with the Holy Ghost", (Luke 1:41). On part of the south wall was an inscription in Georgian, dated 1288. 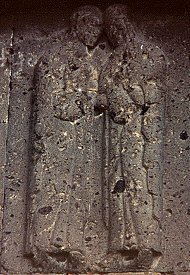 When the fallen remains of the rest of the south wall were excavated in 1910, another inscription in Georgian was recovered. This inscription was discovered on 44 facing blocks of stone, out of a probable original 50, and was 20 lines long. 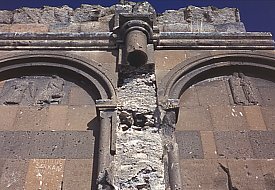 The fragments were removed, re-assembled, and displayed outside the Ani museum (the Minuchihr mosque). After the First World War the inscription vanished. 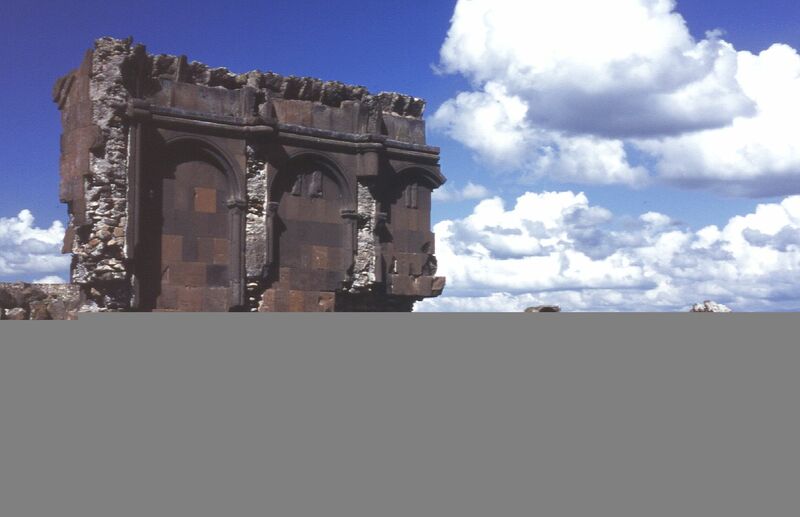 In 1998 five of the missing blocks were discovered built into the walls of houses in Ani (Ocakli) village. 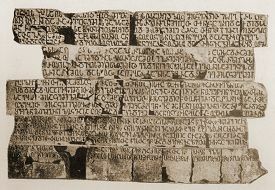 The inscription was dated 1218 and recorded a pastoral sermon by Epiphane, the Catholicos of Georgia, to Georgians living in Ani. At the end it was signed (in Armenian) by Grigor, the Armenian archbishop of Ani, and by the emir Vahram, the governor of Ani. It announced the reduction of Church taxes, encouraged the faithful to be more generous, and warned the Georgian priests against following heretical practices. 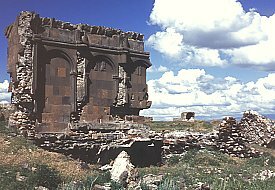 During this period "Georgian" did not simply mean an ethnic Georgian, it had a denominational meaning and would have designated all those in Ani who professed the Chalcedonian faith. Although the Georgian Church controlled this church, its congregation would have mostly been Armenians. No building inscriptions survive to date this church - the Georgian inscriptions could indicate a 13th century date, when Ani was under Georgian control. Alternatively, it could have been constructed during the early 11th century. 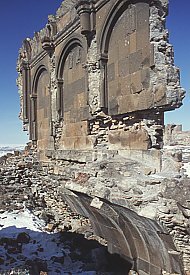 This page [the Georgian church at Ani] was first published on the 9th November 2002. It was last modified on the 9th November 2002.